When people who know go to Tokyo, they buy one souvenir. Make that, the best souvenir. They buy Tokyo Banana. And that snack just got better because it’s getting a Kit Kat version. Or maybe Japanese Kit Kats just got better because they’re getting a Tokyo Banana flavor. The point is, Tokyo Banana are excellent. They are soft and fluffy on the outside, and on the inside, they have a banana filling that isn’t too sweet or two sugary. And Japanese Kit Kats are the best in the world. They’re crunchy, covered in delicious chocolate and come in interesting flavors. Who doesn’t like them? They’re wonderful. So combining them will automatically make them better, right? Right? You don’t have to decided which one to get. According to Fodors, the Tokyo Banana debuted in 1991 and is exclusive to, well, Tokyo. In recent years, there have been other Tokyo Banana flavors and varieties, like Tokyo Banana with a caramel, a maple banana (pictured, below) or even a pudding filling. Yes, Japanese Kit Kats are neat. And Tokyo Banana flavored Kit Kats are even neater, but regular old Tokyo Banana is good, perhaps the best thing you can eat in Tokyo, and I like it. 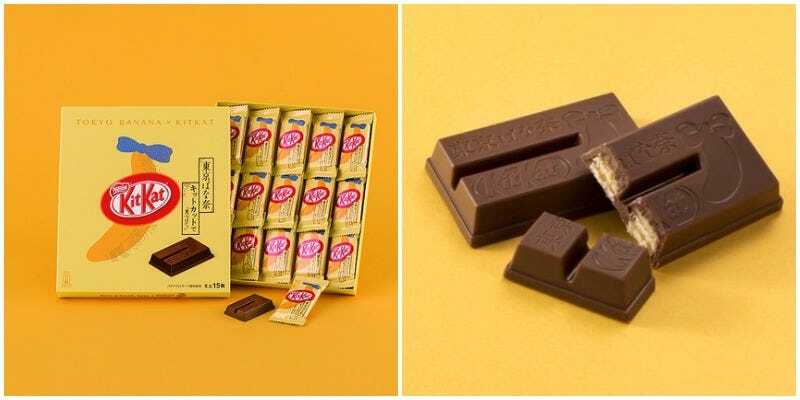 According to Foomi, the Tokyo Banana Kit Kats go on sale November 15 at the Tokyo Okashiland shop in Tokyo Station. Starting January 10, 2018, they will be available at more locations in the Kanto area.